The purpose of this entry is to give photos and information about the condominium. 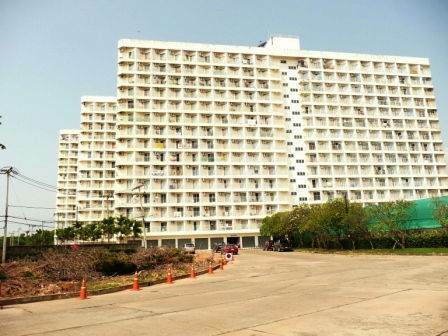 Jomtien Beach Condominium was built in two stages. In 1989 the first two Buildings S1 and S2 were completed. S1 is closer to the beach. In 1998 three further buildings were completed. These are labeled A3, A2, And A1 going from left to right as you look at them from the beach. They are behind S1 and S2. Facilities include 24 hour security, 2 large swimming pools, 2 fitness centres, table tennis room, free bicycles, free aerobic classes, 6 restaurants, 5 bars, hair salon, laundry, about 20 shops, Wi-Fi Internet. The Baht Bus goes along Jomtien Beach Road. This will take you into central Jomtien and central Pattaya.